Quick overview Beginning with the year that Manet exhibited his ground-breaking Dejeuner Sur L'Herbe and ending in 1974 with the first 'Impressionist' exhibition, the author plunges into Parisian life during a ten-year period full of social and political ferment with his usual narrative brilliance. In 1863, the French painter Ernest Meissonier was one of the most famous artists in the world and the darling of the 'Salon' - that all important public art exhibition held biannually in Paris. Manet, on the other hand, was struggling in obscurity. 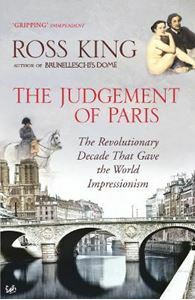 Beginning with the year that Manet exhibited his ground-breaking Dejeuner Sur L'Herbe and ending in 1974 with the first 'Impressionist' exhibition, Ross King plunges into Parisian life during a ten-year period full of social and political ferment with his usual narrative brillliance. These were the years in which Napoleon III's autocratic and pleasure-seeking Second Empire fell from its heights into the ignominy of the Franco-Prussian war and the ensuing Paris Commune of 1871. But it was also a period in which a group of artists, with Manet in the vanguard began to challenge the establishment by turning to the landscapes and ordinary people they saw around them. The struggle between Meissonier and Manet to get their paintings exhibited in pride of place at the Salon was not just about art, it was about how to see the world.